Fully loaded with four wind-resistant torch flames, large fuel tank with fuel viewing window, and retractable 8mm cigar punch, the Vertigo Churchill Lighter is a regal and reliable tribute to Sir Winston's affinity for a fine cigar. This classy and convenient torch comes with everything you need to smoke like a boss, except the cigars. Oh yeah. And it turns red! Does use a lot of juice, so you better get a big can. You can solder pipes with this beast. 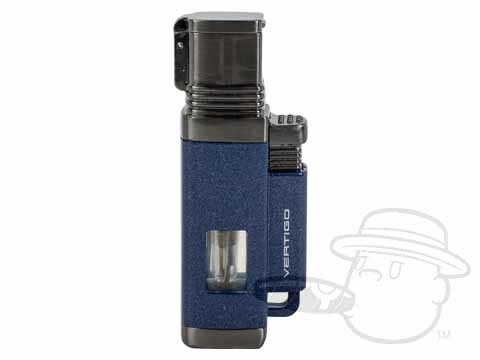 Vertigo Churchill Lighter By Lotus - Assorted Colors is rated 4.3 out of 5 based on 5 customer ratings. where is retractable punch on this lighter? Hello Ben, the retractable punch on this lighter is located on the bottom. There is a little metal lip that you can use to extend it from the lighter.